It opens just in time for the Spanish Benevolent Society's 150th anniversary—and the World Cup. On Friday, June 15, Spain and Portugal will square off in the FIFA World Cup. In celebration of this sacred event, the Spanish Benevolent Society is reopening its beloved basement-level restaurant, La Nacional, which has been closed for renovations for the past few years. Almost as important as the World Cup, depending on who you ask, is the fact that this year also mark's the Society's 150th anniversary. Started in 1868, the Centro Español (Spanish Benevolent Society) was created to support the waves of Spanish immigrants entering New York. Luminaries like Pablo Picasso would stay upstairs during visits to New York and stop by the no frills taverna in the basement that was a local watering hole for the Spanish community. Though it's been many decades since the area bordering Greenwich Village and Chelsea was known as "Little Spain," the Society has remained a mainstay of the Spanish community in the city via its cultural programming—not to mention the dogged support of a team of devoted volunteers who have, according to executive director Robert Sanfiz, brought the organization back from the brink of extinction. 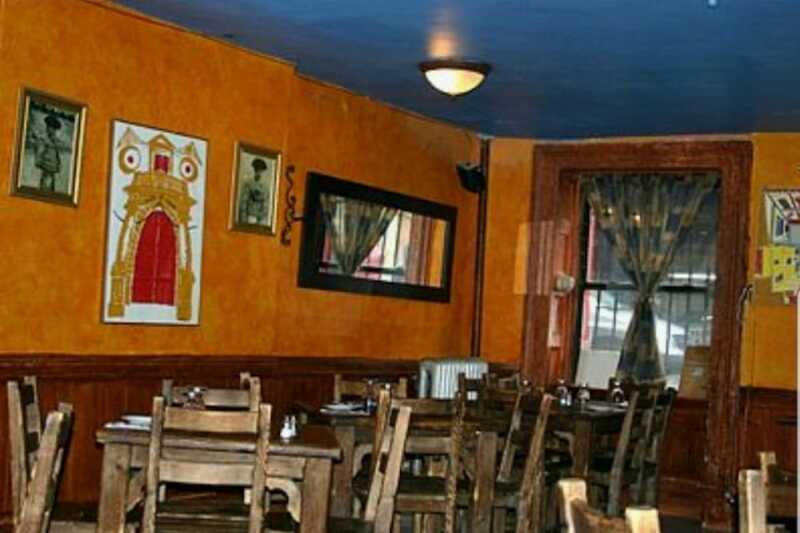 The lower level of the Spanish Benevolent Society—located in the building they've owned on West 14th Street since 1919—has always been home to a taverna. In its early days it was a members-only operation, a place for current members to get a taste of the motherland and visiting Spaniards to feel at home. The Society was in decline when it made the decision to rent out the space to an outside operator. A little known chef from Spain named Lolo Manso—now acclaimed proprietor of Socarrat Paella Bars—came in and opened a tapas and paella restaurant in 2002 that was open to the public. Always regarded as one of the neighborhood's best-kept secrets, La Nacional maintained the feel of a private society's hang out. "While the club makes no effort to draw attention to La Nacional, it is entirely open to the public," wrote Eric Asimov in a 2004 New York Times piece. "The doorway to the street is unmarked, and as you enter a cluttered hallway and stand before an equally unmarked interior door, it is possible to imagine you are stepping into a speakeasy." Sanfiz is grateful that the organization made the decision to lease out the restaurant and says that at the time Manso ran it far better than they could have. But they always knew in the back of their minds that ownership would revert to the non-profit when the time was right. "We wanted the restaurant to reconnect with the Society and the community again," says Sanfiz. "The Society over the last 10 years has really come storming back." In 2014 they closed La Nacional for renovations and amicably parted ways with Manso, who by then was a successful restaurateur in his own right. Sanfiz thought they would be able to reopen the restaurant within a few months, which "is kind of laughable," he says looking back. They soon realized they needed not just cosmetic changes, but a structural overhaul. Years later the restaurant is finally reopening thanks to contributions from the community. "No one who was involved is in the restaurant industry—it was just a dream for all of us," according to Sanfiz. "There's probably 100 people associated with this project who either worked for free or basically free." Individuals donated money, experts gave their time or worked at cost, and Spanish companies provided much of the equipment. 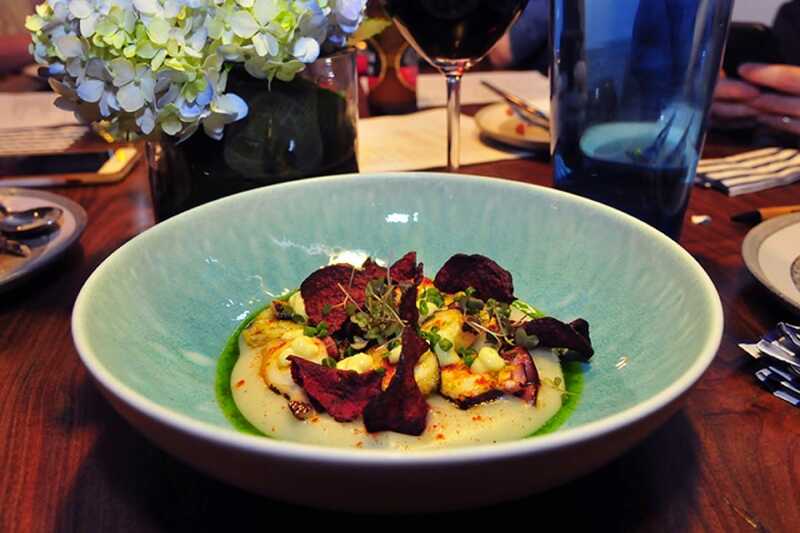 Even local restaurateurs who might consider La Nacional as competition stepped up to the plate. In particular, Sanfiz shouts out Louis Skibar, who co-owns Coppelia with chef Julian Medina down the block. "Not only did he donate an awful lot of money to bring back our fireplace, he also really took care of the chefs and helped us with mentors every step of the way. If I had any questions he'd say, 'I'll be there in 5 minutes.'" The restaurant retains its old charm but with modern, stylish touches. They removed the cluttered hallway to open up the space and make it more inviting. (Sanfiz recalls more than a few people turning around and walking out when faced with the unwelcoming entrance.) Rustic exposed brick contrasts with bright red banquettes. There are cozy round booths, a long communal bar table, standard tables for parties of two and four and seats at the bar where guests can have a front row view of the action in the kitchen. There is also a private dining room that can accommodate 22. 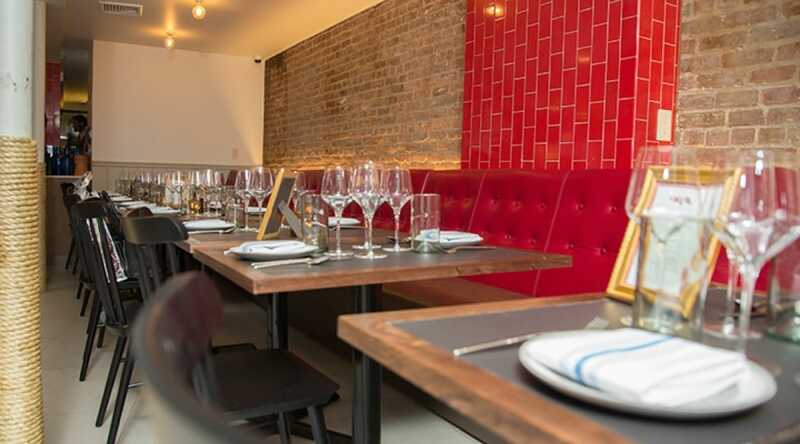 Four Valencian chefs are behind the food at the revamped restaurant: Salvador Burguera, Gracia Sales Marti, Javier Parreño Grande and Jordi Morera Siscar. The Society is sponsoring their visas and putting them up in apartments in the brownstone for one year while they run the kitchen. "The whole spirit is we want people to try modern Spanish cuisine in a friendly community environment and pay those types of prices," explains Sanfiz. "Because we own the building and because we are a non-profit we knew we would be able to experiment with reasonable pricing." Through the restaurant, the Society aims to support the larger Spanish community as well as the local neighborhood, and hopes to be able to offer health insurance to its kitchen staff in the near future. The menu will be about half "standard" items you'd typically find at a Spanish restaurant in New York (like gazpacho, paella and flan), while leaving room for the chefs to experiment with the rest of the menu (like lamb chops with cauliflower tabouli and 65-degree eggs with mushroom puree) and in the form of daily specials. Sanfiz, who is a lawyer by trade with a storefront legal office on the block, speaks with passion about the project and all its possibility, but claims they aren't doing it for the accolades. "If they come naturally, great, but we are not seeking them." Their main ambition is to see the Spanish Benevolent Society—with the help of their restaurant—thrive for another 150 years. La Nacional's hours are Wednesday and Thursday from 4:00 p.m. to 10:00 p.m., Friday and Saturday from 4:00 p.m. to 11:00 p.m., and Sunday from 2:00 p.m. to 8:00 p.m. (Reservations are accepted.) Happy hour will run from 5:00 p.m. to 7:00 p.m., with soccer specials and Sunday suppers also planned. There are hopes for lunch service starting in September, and maybe even late night churros on the weekend. 239 West 14th Street, New York, NY 10011. 917-388-2888. Hero photo by Eliza Piccininni. 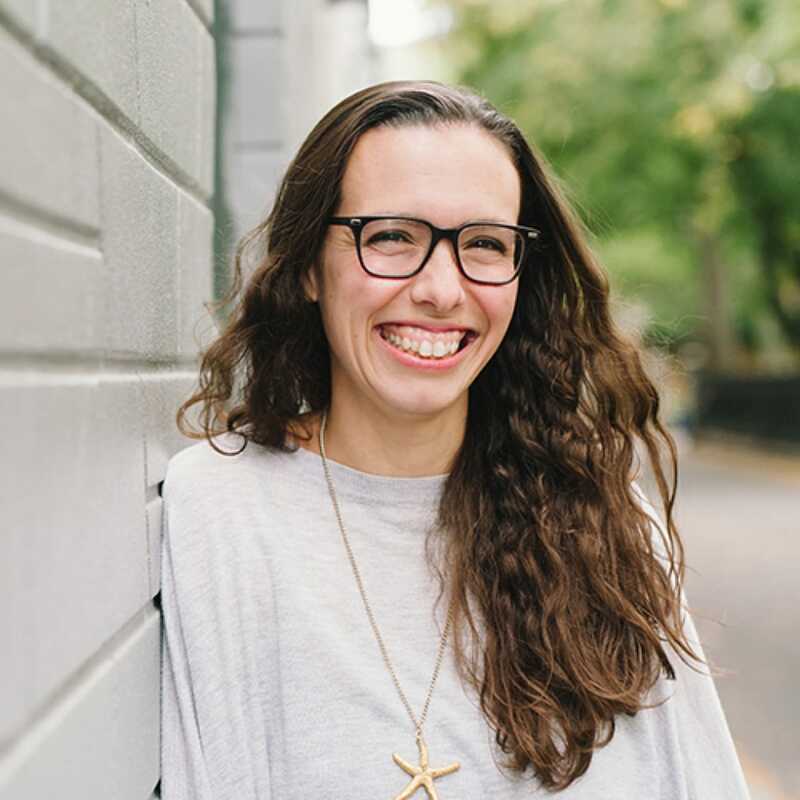 Katherine Martinelli is a Brooklyn-based freelance writer covering food, travel, lifestyle, and more. Her work has been featured in Bon Appétit, Food & Wine, and Travel + Leisure, amongst others. She is also a recipe developer and mom of two who loves to cook, eat, and travel. The kitchen is her happy place.